Waterparks are one of the best ways to cool off during the summertime, and one of the most fun! 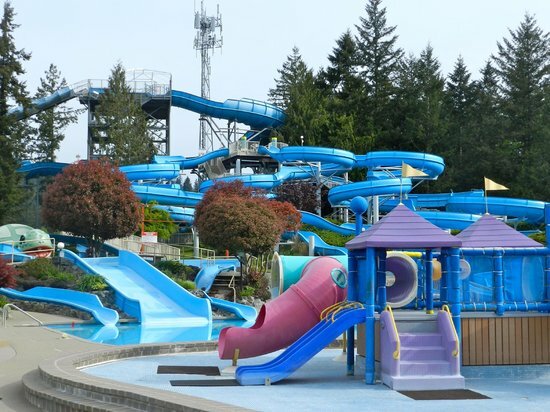 If you’re looking for the best waterparks to take your family to then look no further because we have made a list of the most splash-worthy waterparks in the Greater Vancouver area. Find the perfect one or try them all! The Granville Island Waterpark is free and is one of the biggest public waterparks in Vancouver. It is exclusively meant for young children with an area built specifically for toddlers, making it the perfect place for young families to cool off. The location is fantastic as well as it is in the heart of Granville island, making it accessible and close to restaurants and other amenities. The park features a water slide, sprays, fire hydrants, and water pipes, however not all of these are open every day. Be sure to check the Granville Island Waterpark for full details. This free waterpark is located in beautiful Stanley Park and is intended for children aged ten and younger. It features sprays, water cannons, and water pipes for the kids to run through and, possibly best of all, provides a gorgeous view. This park is a haven where kids and parents can cool off and and recharge after exploring the park. It is also just a short walk away from the Vancouver Aquarium which you and your family could visit beforehand for a full day of water-filled fun. For the exact location and hours of operation, visit the City of Vancouver‘s website. If you are willing to travel outside of the heart of Vancouver, you will likely want to check out Tsawwassen’s Splashdown Waterpark. It is the only waterpark in the Greater Vancouver area that boasts all the amenities you could possibly need, including food services, washrooms, and picnic areas. This waterpark is suitable for all ages and has areas designated for children. There are slides for all levels of riders from tame to extreme, as well as pools and giant tubing slides. For hours of operation, directions, and admission prices, visit the Splashdown Waterpark website. This massive park in Richmond is what children’s playground dreams are made of with 30 acres for them to explore. The park itself is fishing village themed and it features a waterpark and 25 metre outdoor pool. There is seating for spectators, an area specifically for smaller children, and a 3 metre waterslide. The entire park is open from dawn until dusk and has both sun and shade making it easy to spend an entire day playing. The area of Steveston also has ice cream parlours, restaurants, and coffee shops for snacks and other amenities. Visit the City of Richmond’s website for more details. This free Surrey waterpark is big and has a lot of spraying and gushing attractions. The waterpark is situated in beautiful Bear Creek Park, which also sports expansive gardens and shady trees with tons of grass to picnic and lounge on. There is also a playground and a miniature train to keep the little ones happily busy. For more information about this park and others in Surrey, visit the City of Surrey’s Website. No local waterpark list would be complete without mentioning Cultus Lake. While it is well outside of the Vancouver area – in Chilliwack to be exact – it is definitely worth the drive to spend a whole day there. The waterpark has been recently upgraded and features fun for all ages with everything from kiddie pools to free fall water slides. One of the newer attractions are the Bazooka Bowls where riders are shot down a waterslide and into giant 30-foot wide bowls where they spin before dropping nine feet into a pool of water. There is also a slide where riders can race each other, various rafting rides, and tons of other attractions. The park has all the amenities needed such as washrooms, food stands and restaurants, and picnic areas. The park is of course located near the actual Cultus Lake, where there is a popular public beach with a huge dock system that makes for fantastic swimming. Making use of both the park and the beach will make for a full day of summertime fun. For admission prices, park hours, and other information, visit the Cultus Lake Website. There are many more city-run waterparks all over Vancouver in addition to the ones listed above. For a full list of them and to find the one closest to you, visit the City of Vancouver’s waterpark and wading pool webpage here.